Great Britain Freeski head coach Pat Sharples has played down concerns that ski and snowboard slopestyle could be banned from the Winter Olympics. An International Olympic Committee official said injury rates in the discipline at Sochi 2014 were too high for it to continue in the Games. 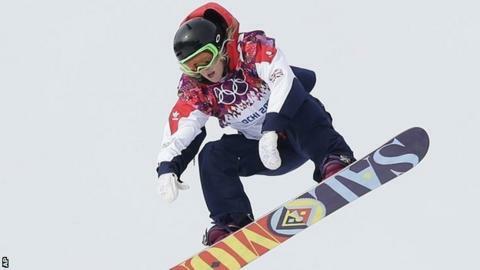 Jenny Jones won GB's first ever Olympic medal on snow with snowboard slopestyle bronze in Sochi. "I really can't see it being dropped at all," Sharples told BBC Radio 5 live. "It was too big a part of the Winter Olympics. I thought it brought something very different to the Winter Olympics and everyone has been raving about it." Lars Engebretsen, head of scientific activities at the International Olympic Committee's medical and scientific department, is the official who has raised the possibility of the slopestyle not returning in 2018. However, he is not on the IOC board that will make the decision. Sharples says he was "surprised" by Engebretsen comments and defended slopestyle's safety. "Slopestyle is an extreme sport and it is the first time it has ever been shown in the Olympics," he said. "Every discipline in the Winter Olympics can be dangerous and surely there have been a lot more accidents, crashes and injuries in stuff like ski cross and border cross. "At the end of the day, that is a part of what we do and a risk you take."